A Month Into The New Year…How Are You Progressing And What Are Your Results? I haven’t heard any New Year’s Resolutions talk lately. It’s not even February yet, but I bet a lot of us are already disregarding or having a hard time implementing our resolutions. Things tend to change quickly in our lives…don’t they? No worries because this is exactly the right time to get serious with your goals for the next 12 months. All the hype for 2012 is now being trivialized. The serious people are now going to rise to the top if they haven’t already. Where do you stand? 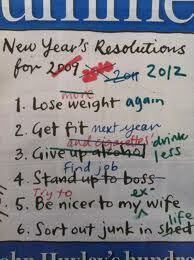 Well, lets get down to the basics…did you even bother to write your 2012 goals down? If you didn’t… take the first step towards real change. I’m not surprised if you’re feeling frustrated or complacent about earning some real life results in the upcoming 12 months. You have to outline what you want, right? What is the life you want for yourself in the upcoming year? Remember, only about 5% of the population writes down their goals. You have to make your commitment…you have to write down your goals…NOW! Your goals need to go down on paper as actions steps. I have my goals on my fridge now that include: health, career, financial, travel, charity, and relationship goals. I’m also copying a set for my bathroom mirror so I have to see them in the house regularly. You can put down what’s important to you in action oriented words like: I will and I am going to. You have to be SMART when detailing out your goals. That means your goals must be specific, measurable, attainable, relevant, and time limited. Believe me…you will be empowered by just writing your goals down and deciding what you really want. Remember you just went to the head of the class…only about 5% take this step. You can modify your goals accordingly as you go through the next year, however you have to make the decision to commit to your goals, read them often, keep them where you can always see them, and remember that you can do whatever you set out to do! It’s only a matter of how badly you want to achieve your goals. Are you hungry? 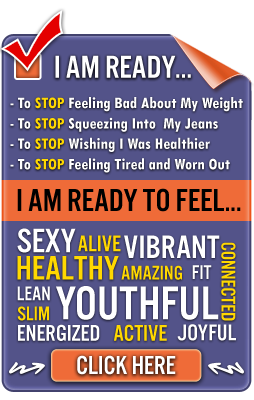 I know you have the power to achieve amazing success and not only with regards to your health and fitness. One of your key components to mastering your mind so you can achieve all the goals you have listed is to work on your personal development in 2012. Keep reading, learning, and asking questions as often as you’re able. Minimize the noise and confusion in your life and stay focused. Think about being active with your life instead of being passive…turn off your tv and get excited about learning something new or something that truly excites you. Your body of knowledge will grow immensely. You will be developing your lifelong process for learning. If you haven’t found your passion yet…you will as you continue learning and applying what you learn…and your list of goals you’ve detailed out will become easier to achieve because you actually love and have a passion for what you’re doing. Another key component of your success in 2012 and well beyond is your belief system. Your belief system can make or break you. Your life experience has a direct influence on how powerful or weak your belief system is. As an example… when your life is just clicking along and everything seems to be going right… your confidence level is up and so is your belief system. You know you can do whatever you set your mind to. On the other hand… if you’ve been struggling…maybe lost your job or failed at something important to you recently you lack confidence. Your belief system is weak and your confidence is causing a bit of uncertainty in your life. You have to know you can do things if given the opportunity. Even if you aren’t given the opportunity, a strong belief system will help you get through the tough times. Your belief system should be your best friend because if you don’t have confidence in yourself and what you can achieve… how do expect others to have confidence in you? Even though I began to speak with you about your resolutions for 2012, you can see a much more complex process to programming yourself for success. It takes a lot of initiative and follow-up, but if you chop it up in steps it’s all digestible and applicable. 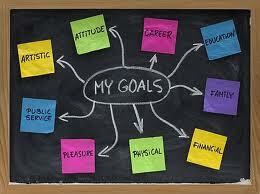 There are many types of goals you may have but don’t have so many goals they become unattainable. Your goal setting should challenge yourself and you shouldn’t worry about failing because your energy needs to be applied into outcomes you have control over not the ones you don’t. Every high-achiever fails…it’s part of the process. You will learn the most from goals you failed to achieve, but most likely you will make them SMARTer the next time around. You will make them more specific, more measurable, more attainable, more relevant, and more time limited. You will learn unique strategies and be able to modify your steps so ultimately you will increase your success and most definitely enjoy your life more. Action is the name of the game though…you have to want this…you have to prioritize your goals. Your commitment level has to be high in order to be successful. I hope you noticed I didn’t speak specifically about health and fitness goals in this post. The process I’m sharing with you is more about life and not just health and fitness. When you take massive action in your life and you are organized and focused… your achievements are amazing! You will grow so much as a person. You will be able to help others be more successful too. I always like to see my friends more successful because it influences me to work harder and achieve more as well. It’s contagious and it’s a habit we can all benefit from. You have to take time out of your day though. You have to block time out so that you will learn the proper discipline to “get things done.” You can’t let anyone get in your way and compromise your schedule. 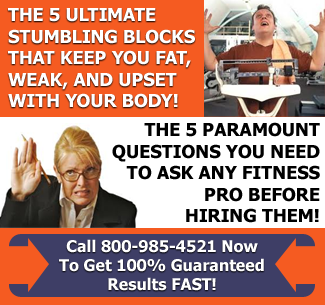 The blocked time you make will enhance your life personally as well as professionally. Don’t be one of those people who say “there just isn’t enough time in the day to get everything done.” This is an excuse for a person who didn’t map out and commit themselves to what they really wanted. You don’t want that to be your excuse…do you? If you need help don’t be afraid to ask. The most successful people in the world get support from professionals and find the right coach to work with. Approach this next year in steps… day by day and week by week and so on. Practice habits that reward your desires (your goals) and that reflect the kind of person you want to become. Don’t forget to review on a regular basis because we all get off track at times. It’s the ones who get back on track the fastest who attain their goals the quickest or who accomplish them at all. Ups and downs are a part of life, but ultimately you decide your attitude and outcome. What will the next year bring you? How bad do you want it? Are you ready? Are you committed? What are you committed to? Post your commitment above and I will hold you accountable. Don’t forget to have fun and enjoy each day you live.